Have woken up in a super-grumpy mood this morning and for no good reason! Had a mammoth lie-in, probably just stayed in bed too long to be fair. Spring is definitely here. And we never even really had much of a Winter. Glorious sunshine and wind at the stables on Thursday, intense showers this morning. Spring. Mum received the first print proof of the colouring book! I sent it to her to get her thoughts and she loved it. Said she’d have bought it for me as a child, which means it’s doing what it’s meant to do. I’ve obviously seen the PDF proof and I had thought to myself, “if mum likes it and can’t see any typos, etc., I’ll just go ahead and publish.” But now I’m thinking I really should see the print version myself before doing that, to double-check everything. I’m excited though! For anyone who has ever had mild depression, anxiety, or even just lethargy brought on by poor nutrition, you may know this to be true. At certain times in your life, brushing your hair might feel like a huge effort, nevermind getting out of bed, dressing, having breakfast, going out, etc. etc. I’m not in one of those times, but I know what it feels like and he does too. But when he said this, my brain didn’t go to those thoughts, it went to animals (naturally!) and the concept of Behaviour Shaping (breaking down the desired behaviour into ever smaller chunks, so that each step is easily achievable and builds confidence by being so). I said, “ah John, it’s such a shame you don’t love ponies or we don’t have more pets, you’d be so good at it!” I do hope to get a dog for him one day, when our circumstances are different. And I know that he can’t help but become friends with animals when he spends time with them, so perhaps in the future when I have a pony he’ll get interested by accident, haha. 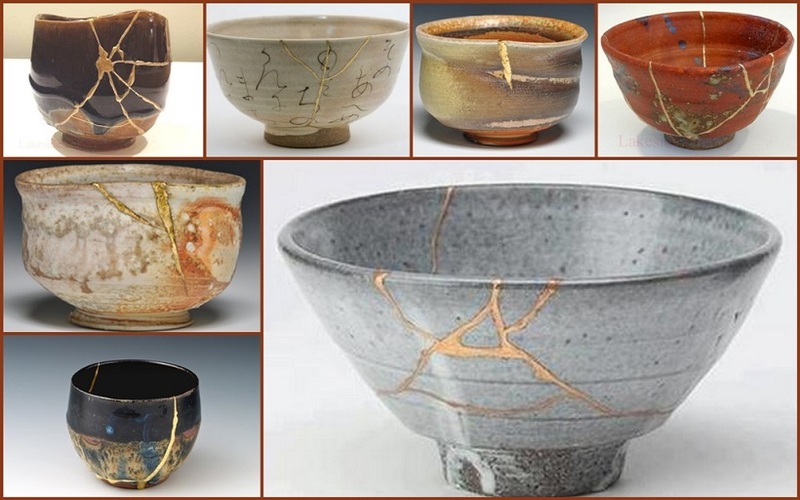 Then as I was gathering up all his parts, I remembered having seen some examples of kintsukuroi (or kintsugi). I love the whole ethos of it. I always love couture or otherwise elaborate garments that have history, that show signs of wear or repair, so it makes sense to like the same in pottery. The golden lacquer of kintsukuroi, the way it makes the item’s history (“negative” history if you like… damage, trauma) a visible part of its repair, that really appeals to me. I’ve therefore ordered a golden repair kit. If it works he won’t look “like new”, he will look like he lived and be more beautiful for it. Right, time to work. Spent yesterday evening studying the equine nuchal ligament (elastic recoil as an energy saving device, the pendulum motion of the neck/head, the angle at which the NL is no longer engaged and all the work is on the neck muscles), might revisit that today and see where it leads. I’ve almost gotten over this grumpy mood! Previous Post First driving lesson!